The launch involved key partners who are supportive towards the campaign including the Cook Islands Police, Punanga Tauturu Inc, Ministry of Internal Affairs and the Ministry of Health. Also attending the event were ambassadors who will front the campaign throughout the year including national football representatives of the Cook Islands, Mii Jospeh and Marissa Iroa. In her opening address, project manager Michelle Paiti noted some of the disturbing facts about domestic violence as being accepted in the day-to-day lifestyles of Cook Islanders. “Violence against women is widely condemned as a fundamental violation of human rights and is recognised as a significant public health problem,” she said. “Breaking the cycle of violence requires us all to work together. 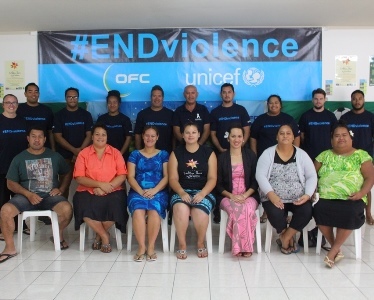 The domestic violence coordinator from the Cook Islands Police, Sharon Kareroa, highlighted their support towards the campaign noting the active role and impact that the Just Play Programme has had on the communities of Rarotonga. “We are very pleased to be supporting this initiative and it is through Just Play and their programme working with children that we are able to target this young age group, in helping them become aware of the key message that domestic violence is NOT OK.
Next Tuesday the first event of the campaign will roll out in the form of a football festival, hosted at the CIFA Complex. The festival will provide fun activities for all children ages 5-13 years old, and during the event participants will devote some of this time towards a “Weave a Star” session, led by the Punanga Tauturu Inc.
“The Weave a Star project is a movement happening across all the Commonwealth countries and what it is, is that the star signifies light of hope to those affected by violence and the ultimate goal is to have one million stars weaved in time for the Gold Coast 2018 Commonwealth Games where it will be exhibited,” says Paiti.